This is an easy vegetable lasagna recipe made with red bell peppers or capsicums, feta and a generous amount of walnuts. Add spinach or peas to this dish, if you wish. This lasagna is essentially flat pasta sheets layered with vegetables of your choice, cheese and a white sauce, called bechamel poured over and baked. I found the feta is sufficiently tasty and there is no need for further seasoning. This recipe makes enough for 8 generous servings of lasagna. • Melt butter on low to moderate heat. • Keep stirring till there are no lumps and the sauce thickens. This will take about 15 minutes. It's important that the milk does not boil. • Preheat oven on to 380F/190C. • Spoon one layer of bechamel into the lasagna tray. 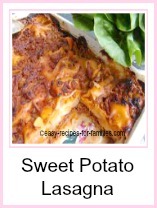 • Add a layer of dry instant lasagna sheets straight from the box. 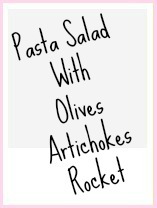 There's no need to cook the pasta. • Ladle a layer of white sauce followed by 1/3 of the peppers, feta cheese and walnuts. 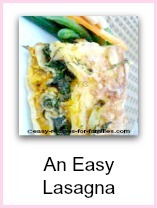 • Repeat twice - a layer of lasagna sheets, followed by a layer of bechamel, then vegetables and nuts. • Sprinkle the top with shredded cheese. 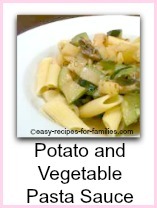 • Place in the center of the oven and cook for 35 minutes till the top is nicely brown. • Leave to rest for 10 minutes before serving. Serve the lasagna hot accompanied with a crisp green salad and crusty bread. If you'd like the lasagna to have extra texture and body, add diced carrots. If you don't have a lasagna dish, use a rectangular oven proof dish with deep sides. Don't overfill the dish as otherwise the liquid and cheese will bubble over making a mess of your oven. Use dry lasagna sheets, straight from the box into the dish. There's no need to pre-cook it. Bechamel sounds scary, but it really is incredibly easy to make. Substitute your another vegetable in place of bell peppers but I recommend a vegetable that is not "juicy" or it'll bake the lasagna too soft and wet. Spinach is a good substitute. You could have layers of different colored bell peppers for a striking tri-colored layers of red, green and orange, with red bell peppers, green spinach and orange pumpkin or carrots, in each of the three layers. This is a no fuss, easy vegetable lasagna recipe. The white sauce takes about 15 minutes to make and that is the fussiest part of this recipe, as you do have to constantly stir it. But the assembly is straight forward. It's just layering of the pasta, sauce and cheese. We love recipes like this, which are certain to WOW your family and friends! 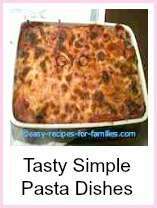 Leave Easy Vegetable Lasagna Recipe to explore the hundreds of sensational easy healthy recipes to WOW your friends and family!